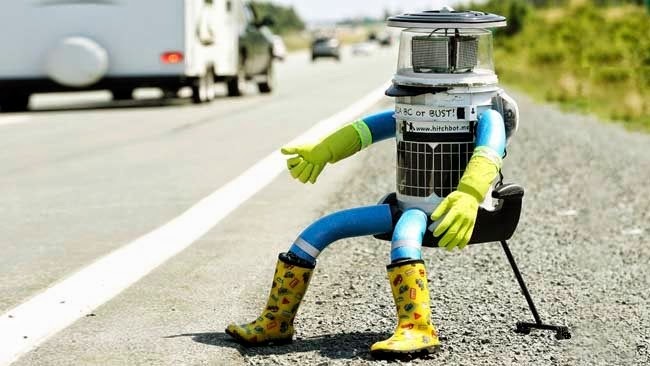 Armed with little more than a primitive ability to beg for rides, a Canadian robot aiming to hitchhike from Halifax to Victoria has already made it to the Quebec border in its first 24 hours. Now, hitchBOT — a device constructed from a plastic bucket, solar panels and a tablet computer — only needs to cover the remaining 5,600 kilometres without being smashed, stolen or dismantled. The device is equipped with arms and legs made from pool noodles and a simple LED screen displaying a smiling face. It has no moving parts and is designed to cajole drivers into picking it up, using a rudimentary ability to understand human speech. Drivers are also asked to plug the robot into their car’s cigarette lighter to charge its batteries. 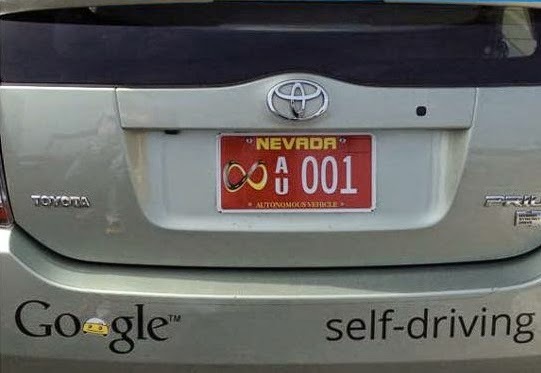 The Nevada Department of Motor Vehicles approved Google’s license application to test autonomous vehicles on the state’s roads. The state had approved such laws back in February, and has now begun issuing licenses based on those regulations. Google’s self-driving car is still at least five years away from commercialization, but the team behind the project has made remarkable progress since starting work in 2009 (taken from WIRED magazine). Avoid creaming cyclists: In the event a cyclist actually decides to warn traffic before he turns, the car notices. Thanks to laser imaging, the car recognizes the hand waving and will expect the cyclist to move over. Be aggressive: It turns out self-driving cars tend to be too polite. Google noticed that at four-way stops, the car stayed behind the stop line, waiting for its turn. Naturally, human drivers, seeing it just sitting there, took advantage and crossed ahead of it. So the team rejiggered the car to slowly inch forward at stop signs, signaling to other drivers that it wants its turn. Break the law: For city driving, Google keeps it legal. But on the highway, team members adjust the settings to let the car drive above the speed limit, to safely keep up with the flow of traffic. Pick up on potholes:Like with speed bumps, the car spots potholes and slows down before hitting them. It doesn’t drive around them, though, so owners should think about saving up for a new suspension once in a while. Predict the future that didn’t happen: Say the driver takes control because he isn’t confident the car will properly handle a tricky situation, like navigating construction. The car shoots all of the info its sensors are picking up, so the team can run a computer simulation of how the car would have acted if the operator had let it handle things. That means Google doesn’t have to find out the hard way it needs to tweak the car’s behavior. Go off the grid: Like a millennial, the car gets upset when it can’t get a cell signal, which gives it access to Google’s bank of detailed maps and let it send new information back home. No worries if the connection is a bit slow, but if it drops out, the car will “do something safe. (b) Who will be liable when an autonomous car crashes with a driver-driven car? 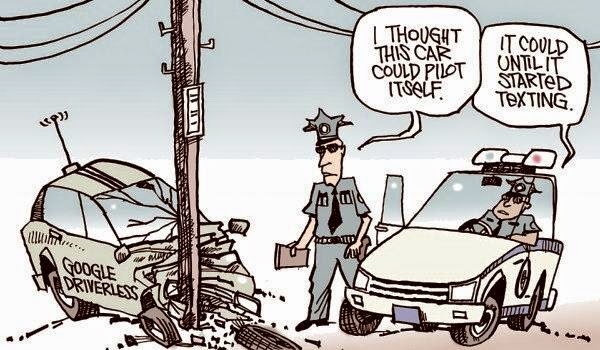 Or if two driverless cars collide? The New Yorker (and other Internet sources) have interesting comments and debates. 5) What About Speeding Tickets? (a) Fines for speeding are always a problem. Different countries have tried different approaches. For instance, setting the fine in accordance with the person's income has led to to HUGE fines in some countries. (b) Although one would expect a robot car would never speed, Google's cars are programmed to break the law in the interests of safety in some cases. And then again, there are "speed traps". My friend Derrick reported on Facebook the following discussion when stopped by the highway police . The policeman :"Didn't you see the speed sign? " Derrick: "Of course I saw the sign. It was YOU I didn't see." Will driverless cars be programmed to detect police? (c) Who will be responsible for speeding tickets? With driver-driven cars the responsibility is usually with the driver as being in charge of the vehicle. With autonomous vehicles it would probably be the owner? Or the vehicle programer? Will autonomous cars be programmed to pick up hitchhikers? And if so, will they stop for a hitchBOT standing on the roadside to give him/her/it a ride?